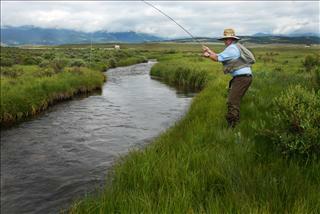 Description: This scenic ranch in South Park affords two miles of pure meadow stream fishing for browns, rainbows and brook trout. Meandering through fields of grass and native cinquefoil, the creek averages 10 to 15 feet in width. It is easy to wade with a stream bottom of gravel and sand although some bend pools are as deep as six feet. Location: Located a little more than an hour's drive from southwest Denver, this section of Michigan Creek is approximately 2.2 miles from Jefferson off of Litmer Road. Capacity: 2 anglers or 3 if all in one group.